Looking for self-adhesive custom stickers, custom decals, or labels? We have the material, equipment and experience to quickly produce one custom decal or 100,000 custom decals. Our custom stickers and custom decals are great for indoor or outdoor use. We can custom cut your custom stickers, custom decals or labels to any shape or size up to 50" wide OR high. No artwork available? Our experienced and creative art department can create the perfect design for you. We are always happy to email a proof for your approval before production! Salt City Signs are the go-to professionals for sticker printing and custom stickers near Syracuse, NY and the surrounding regions. 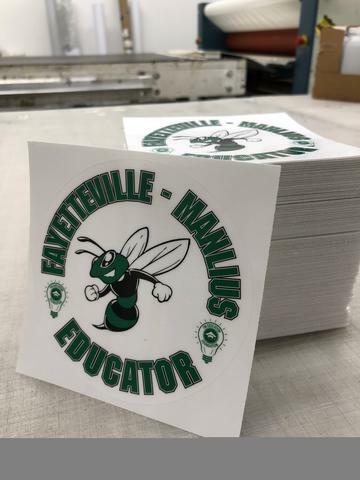 We create attractive custom stickers that are great for increasing brand awareness, or for providing a cohesive look for your team. For more than 17 years, organizations of all sizes have depended on Salt City Signs for sticker printing services and custom stickers. Whether you're a business, non-profit, school or any other type of organization, Salt City Signs can create custom stickers with the look you need. Whether you know exactly what you want your custom stickers to look like, or you need professional input from our creative design team, Salt City Signs can provide the custom stickers you need. Beyond custom stickers and sticker printing, Salt City Signs is also the trusted provider of custom decals near Syracuse, NY and the surrounding regions. Salt City Signs custom decals are built for indoor or outdoor use. 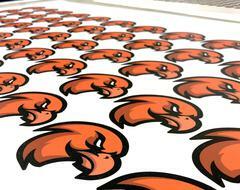 We have the experience and equipment to create the perfect design for your custom decals. Whether you know the exact look you're going for, or you need some creative assistance, trust Salt City Signs to make your custom decals. Salt City Signs is proud to serve organizations of all sizes. Whether you're a multinational corporation looking for branded custom decals, a small business, a school, team or anything in between, we can help. Whether you need label printing, custom stickers or custom decals near Syracuse, NY or the surrounding regions, Salt City Signs can provide exactly what you're looking for. Our labels, custom stickers and custom decals are affordable for almost any budget.